The ELITE Submersible Aquarium Heater offers accurate and reliable aquarium temperature. The Easy-Set Temperature Dial provides precise temperature control. Its ceramic heater core allows for even and efficient heat distribution. 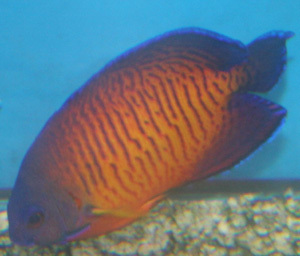 The heater is ideal in fresh and saltwater tanks. The coral beauty, also known as the twospine angelfish and dusky angelfish, comes from the Indo-Pacific ocean region. 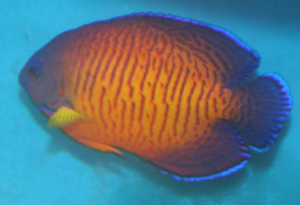 This is an attractive dwarf angelfish that should do well in a mature saltwater aquarium. This is a favorite of many marine hobbyists. Care Level: The coral beauty is a relatively hardy fish to maintain. If its needs are met, it should do well. On a scale of 1 –10, (10 being easy) it would rate a “7”. It should be introduced into a tank that is matured, has plenty of live rock to graze on and prey/food items in the sand substrate. Color: The coral beauty is a beautiful fish. Its primary colors are red framed in blue with non patterned blue/black vertical stripes. The fins will be tipped with blue colorations. This is one of the fish with the best colorations. Temperament: The coral beauty is not overly aggressive and should do well with other non-aggressive tank mates. Do not put two coral beautys in the same tank though – they will probably fight. It would also be wise to introduce the coral beauty as one of the last fish into the tank. Reef Compatible: No – the coral beauty may bite at or eat corals and clams. People have stated that they have had ggod luck in this same situation, especially in large tank setups. Diet: Omnivore - will take a varied diet of chopped shrimp, brine shrimp, chopped squid and clams as well as flake food and plant matter such as spirulina and marine algae. They should be fed 2-3 times each day. High quality vitamin enriched foods should be fed several times each week. Also – as previously stated they will graze on live rock. Lighting: No special requirement are necessary. Habitat: Provide with plenty of hiding places and live rock growth for grazing on and to use for shelter. Good water quality is important. Beauty need good water quality for health and color retention. Compatibility: Coral beauty in general can be kept with small non-aggressive fish such as firefish and cardinalfish. They should not be housed with sharks, rays, large species beauty, moray eels and groupers. It can be a problem if housed with triggerfish. Check with your aquarium shop if you plan on buying one of these fish.